THE PHENOMENON OF ‘INSTRUCTIONAL ART’ & LAW OF TRUST. We are well versed today in the notion of ‘instructional art’. One only has to consider Sol Le Witt’s wall drawings, Yoko Ono’s instructional paintings, or the deeply choreographed ‘directions’ for the performed works presented in the recent Kaldor Public Art Project 13 Rooms (Pier2/3 Sydney). The separation of the conception and production of a work of art is not, of course, new. For centuries students and assistants of painters and sculptors had produced works bearing their master’s name. However, our times have added an inflection to this definition. With cheap offshore fabrication, the peripatetic habits of today’s artist, the immediacy of the Internet as a ‘freight portal’, and kind of de rigueur acceptance of the studio assistant, authorship of the ‘act’ of making has become a layered territory. An edge of this comes into play through the Dispatch project: each of the window galleries tasked to realise an artist’s work sent through the post, via email, or as list of elements to be collected and assembled. In an uncanny sort of way, the title of Leanne Waterhouse’s exhibition, Solitary Cohabitation Revisited, says it all. While it is an individual creative expression, the artwork is revisited with each site, and realised through the collaborative engagement of the ‘installer’. The unspoken protagonist here is trust. First realised as a multi-panel Plexiglas drawing, where faux Rorshach inkblots were stacked one in front of the other suspended in the domestically scaled Box Set @ Northern Centre for Contemporary Art, Leanne embraced the proposition to translate the installation into a transportable version. Destined for a space she had never physically laid eyes on – and one that responds to the unique attributes of that site - was no mean feat. Hanging Leanne’s installation for SLOT it quickly became apparent the instructions supplied were not going to present the artwork at its optimum in the space. Her delicate chains of oval transparencies were swallowed by the volume of the window; their stretch across the 4m glass vitrine rendering them almost vaporous in their definition. It was more like a sprinkle than an immersive blanket of tropical rain, a key metaphor for Leanne in linking her fractured Rorshach blots with the environmental impact of living in the ‘top end’. Having spent a lot of time in Southeast Asia during monsoon season, I understood the physicality of that tropical condition and its ability to penetrate one’s psyche and sense of stability. Simply by compressing the individual units that spatial tension Leanne wanted to convey in the work was realised. This was not a failing of the artwork itself, but that of a spatial reading – to visualise, to test, and to communicate a spatial dynamic. Scale and volume are tricky beasts! I suppose this is where I want to revert back to the window gallery. 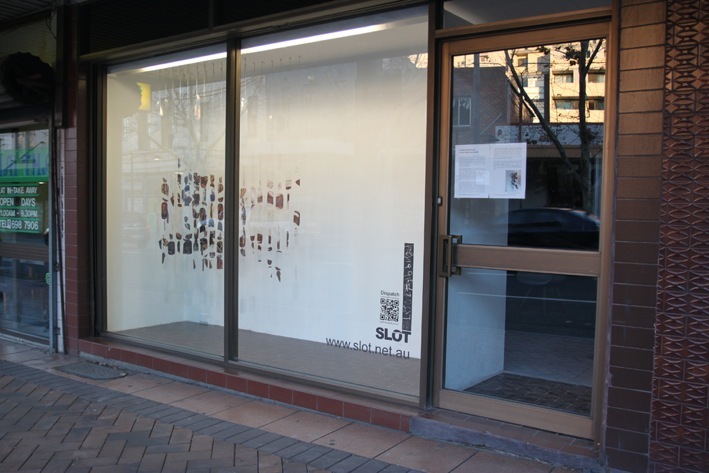 We have always considered SLOT as a space for artists to flesh out or test an idea, to preview new work, or to challenge the more experimental edges of their own practice. Sitting outside the perceptions and demands of the traditional gallery, all the window galleries in this Dispatch project offer that unique place. 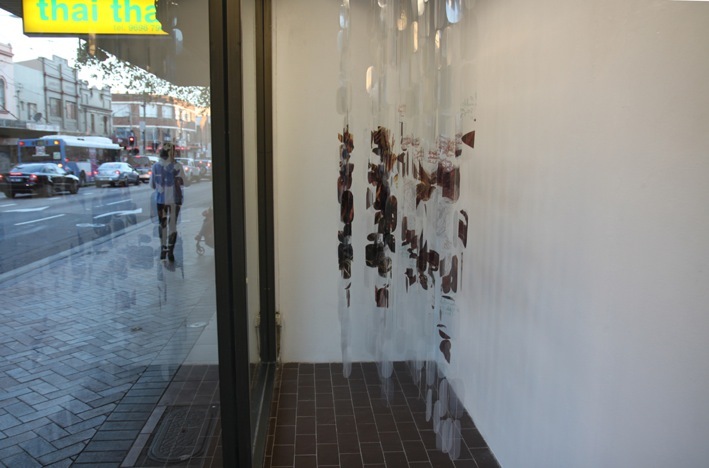 How the artist chooses to embrace that ‘space’ at SLOT has been interesting to observe over our past years, as is the collaborative dialogue between the artist, venue and local audiences as the Dispatch exhibitions move between the project’s seven window galleries. There is the potential for a paper to be written here. As Yoko Ono’s said, “The work becomes a reality only when others realize the work. Instructions can be realized by different people in many different ways. This allows infinite transformation of the work that the artist himself cannot foresee, and brings the concept of "time" into painting.” 1. It is an idea American professor of art and architecture Mark C. Taylor has explored: “Like skin folding back on itself, every self-referential structure has wrinkles that cannot be smoothed out. The gap between touching and touched, seeing and seen, subject and object implies a delay that marks the space of time… time inevitably insinuates itself into the work of art.” 2. Leanne’s piece started from a very personal trigger of living in that heady tropical atmosphere of the ‘top end’ and that interface between environment and metal health. A congested traffic jam on the edge of Sydney’s CDB hardly replicates that environment, but in a strange way the compression of its urbanity and the kind of psycho reveal and isolation of self – raw and on display in a shop window – finds a sympathy. So then, one might ask what is it that is transferred – translated – to the pedestrian and virtual audience of this project? Watching the installation change character over the course of a day – a day that is much the same as another – the clear ovals are bleached by the morning light almost invisible apart from the delicate line of their sewed spine. Finding definition during the course of the day as they capture they eye of lunchtime pedestrians, with the evening the ovals turn into something quiet enigmatic, twinkling like jewels in the dusk light and playing with the reflections of the commuter traffic on the glass. Then, in the quietness of the night, they again find their strength in this cycle, the natural light removed the strongly light forms start to cast shadows and dance, only to fade to a thin apparition with the morning. Is it an expression of the environment’s fragility and cycles? Is it an expression of one’s shifting mental state? If we can let go of the doctrinaire compulsion to assign ‘meaning’ to art, we arrive at the liberating realisation that it will find its own connection with its audience, definitively transportable and trans-lingual. Leanne’s installation Solitary Cohabitation Revisited is just that.